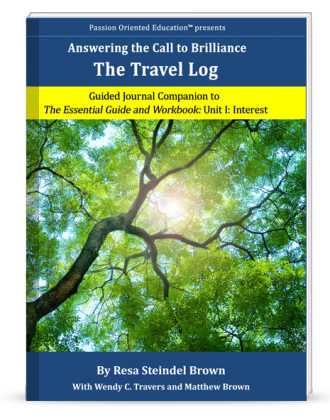 The Travel Log, Unit I Interest, is the first of three guided journals directly coordinated and to be used exclusively with Unit I in Answering 'The Call to Brilliance,' The Essential Guide and Workbook. The Travel Log is designed to help you stay organized and on track while preserving your observations and insights for future reference. 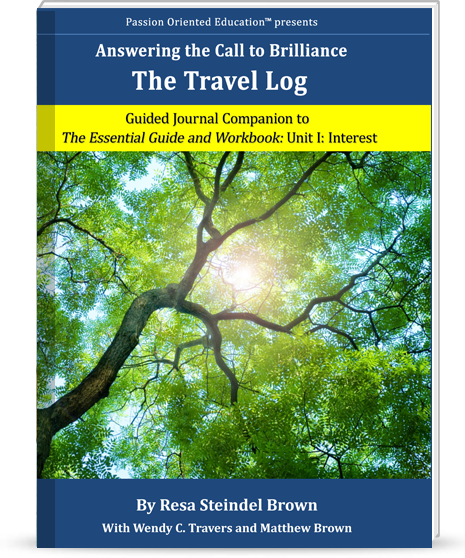 This guided journal corresponds directly and is to be used exclusively with Unit I Interest in Answering 'The Call to Brilliance,' The Essential Guide and Workbook. Both The Travel Log and The Essential Guide and Workbook are broken into three units: Interests, Passions and Brilliance. Each unit is structured to be executed sequentially. First, read the information presented in the corresponding section of The Essential Guide and Workbook, also referred to as The Workbook. Then, use this guided journal to explore and record your observations and ideas. Return to The Workbook to summarize your findings and use that information to execute the respective workbook activities. We know how valuable a little extra help is, so we created The Travel Log as a guided journal to take with you 'on-the-go' as you observe your child and capture the information you need to execute the activities in The Workbook. The Travel Log makes it easy to move back and forth between The Workbook and your observations. The guided on-the-go format was designed to help you capture your thoughts, feelings and insights as they happen so you can better help your child. It is a great way to keep your thoughts and perceptions clear and clean, remember exactly what you observed and take appropriate action as the need arises. You never know when insight strikes and a new perspective or direction reveals itself! When you use The Travel Log, the guided journal companion to The Workbook, you will be organized, prepared and ready to move forward with your child as you use the information in The Workbook to help your child find interests, ignite passions and discover brilliance. In Unit I, we will help you discover, nurture and expand your child’s interests. Based on the information in The Workbook, you will use The Travel Log to record your observations so that you can identify your child’s unique learning styles, forms of intelligence and how your child best creates. As you track your child's activities and chronicle your findings, we will help you fine tune the results so you can explore new activities more aligned with your child's innate abilities and interests. You will learn to identify and log which activities are passive, false, misdirected, or active and internally driven, based on your observations and the definitions in The Workbook. As you jot down your perceptions and insights, we will help you come up with a plan to move forward. Your goal is to prioritize and broaden your child's full range of active interests, nurture and support your child's natural creativity and provide increased opportunities within which passion can grow. We recommend you carry your Travel Log around with you as you move through your week. Using this guided journal will better ensure your success in reaching your goals. You will find it an invaluable ongoing resource and reference as you take this journey of passion and brilliance with your child.